John Hill This is a very nice example of Rope & Ladders, a classic Gansey pattern that was very popular with Whitby fishermen. It’s not exclusive to Whitby – it also appears in Katwijk, for example. These 2 motifs appear on their own, in different guises, depending on what the knitter had in mind, as well as combined with other design elements, eg Scottish Flags – a pattern that came down with the herring lassies. This combination is often currently seen as ‘the’ Whitby pattern. In ‘Fisher-Gansey patterns of N E England’ (Esteem Press, 1980) Michael Pearson credits Mrs Cole with this pattern. 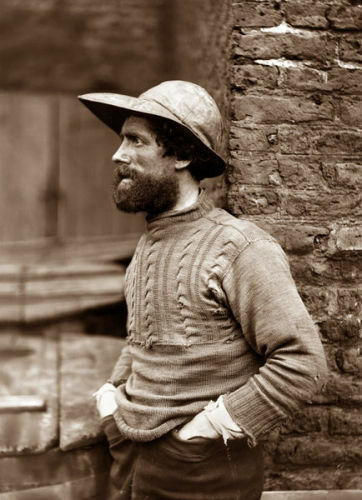 It doesn’t appear in the photographs of Frank Meadow Sutcliffe, who was recording everyday life in the late C19. Rope & Ladders is an easy pattern to knit; it appears fairly ornate but it repeats over about 18 stitches & 12 rows. Patterns are arranged around a central, vertical axis & can be altered to fit the number of stitches required for a particular Gansey. For example, there are 14 Ladders in this Gansey & if everyone was altered by 1 stitch, this would add up incrementally to about 2″ overall. There’s also a very nice shoulder strap. This knitter knew what they were doing. Polperro ‘snake’ This variation is known as the Polperro ‘snake’. It is very similar to the Gansey below but the snake is formed by alternating the direction of the cable or rope. This is done by putting the cable needle alternately to the back/front of the work. This Gansey, from Cromer Museum, is another variation on the pattern theme of Rope & Ladders. The knitter has made her life easy in several ways, ie by turning the wide cable far less frequently than the usual 6 rows; by creating simple ladders with 3 rows of purl around the cable-turning row; and by avoiding the need to fit the pattern to the number of stitches by bordering the whole pattern area with 2 vertical columns of garter stitch. 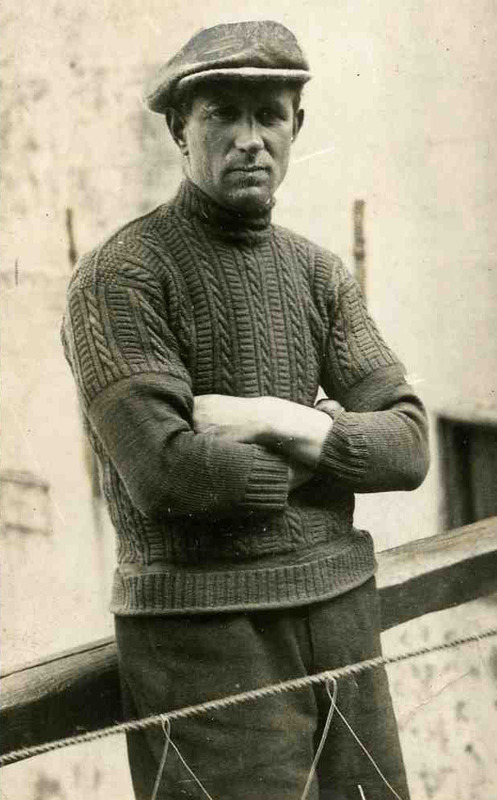 Level with the neck, the last rung of the Ladders rather neatly becomes the 1st row of Rig & Fur, a common shoulder motif using a 3-needle bind-off to join the front & back together. 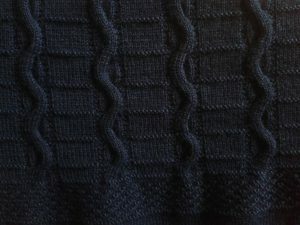 The upper sleeves are decorated with 4 rows of purl. FMS 26. is the catalogue name for this photo. I’d like to know the man’s name too. 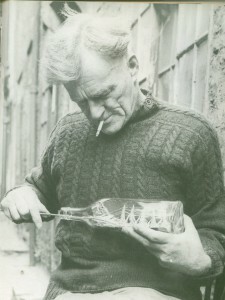 He appears in another of Sutcliffe’s photos but his identity is unknown. However this is one of my favourite Sutcliffe pictures, one of my favourite Rope & Ladders variations & I take my hat off to the knitter who has made her life so easy & yet produced an attractive, efficient pattern. Every other row is in knit stitch & she turns the cable perhaps not regularly, but half as often as would normally happen. 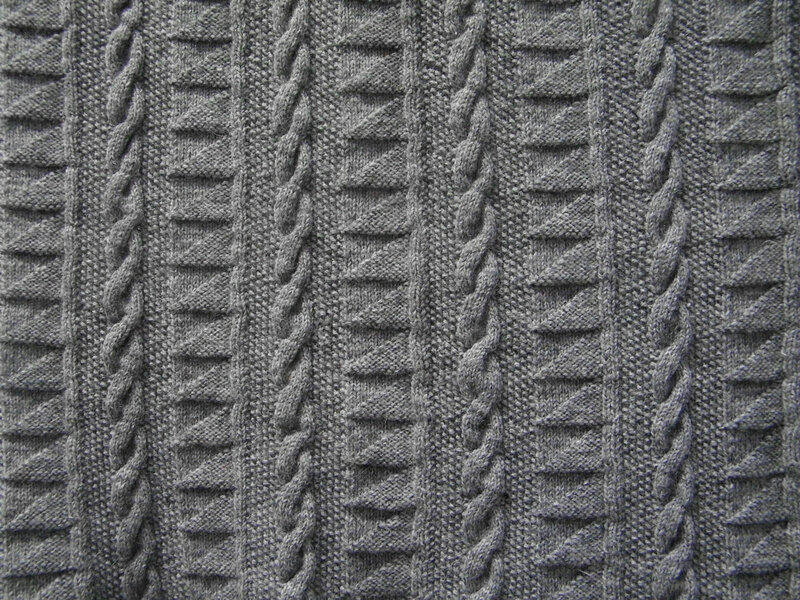 The broad panel of stocking stitch with the offset cable is a motif in itself. Eagle-eyed viewers will spot that the front & the back don’t line up & that Lovick’s Law applies (the more interesting an area, the more likely is a blur, wrinkle or darn). What was perhaps more forensically interesting was deducing that he was not a big man; I’m a generous size 10, I’m knitting on 2mm dpns with 11/” tension & for my own Gansey I’ve had to add a couple of inches or more onto this basic pattern. 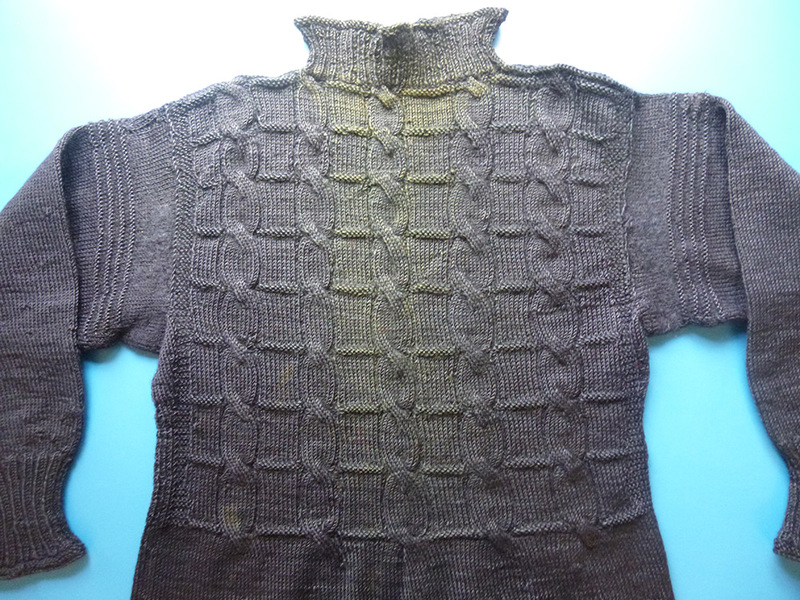 In short, a classic example of the value of primary sources & using your own judgement – which is what this knitter did. John William Storey. Again, basic but attractive & thoughtful, with attention to detail. The Gansey’s not bad either. The shoulder is a straightforward graft with moss. 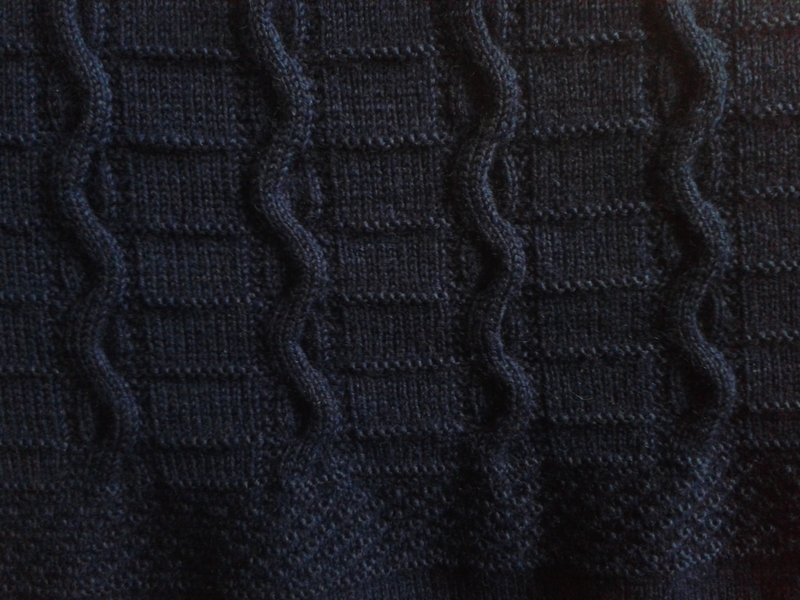 I like the way the knitter has finished the upper sleeve design by reverting to k2p2 rib. This gets around the problem of the bulging elbow at the end of a pattern involving cable. Another way of avoiding this is to decrease at the end of a cable. conversely, increasing at the beginning of a cable can not only ‘make her stand out’, as Mary Wright remembers Cornish knitter Willie Stephens saying, but it also smooths out wavy bits. Not Rope & Ladders, this, but Rope & Scottish Flags, with a bit of moss. It was knitted to represent Whitby & Staithes by Mrs. Jackie Hansell. It defies attempts at notation because she has applied a free-form rather than regular approach to turning the cables. Not only was she not too bothered by this, but it’s just these imperfections that keep the viewers’ interest & makes it more attractive. ‹ You could tell a drowned man’s port of origin by the pattern on his Gansey.